Pamela Cross writes: "Based on 30 years of research by Sandra Niessen into the Batak and their textiles with over two decades of fieldwork and consultation of all major European collections of Batak textiles and private collections in Indonesia. The book is a study of the woven heritage of the Toba, Simalungun, and Karo Batak. It provides a record of more than 100 different design types, including archival and contemporary photographs showing how the textiles are woven and how they are used in Batak culture. 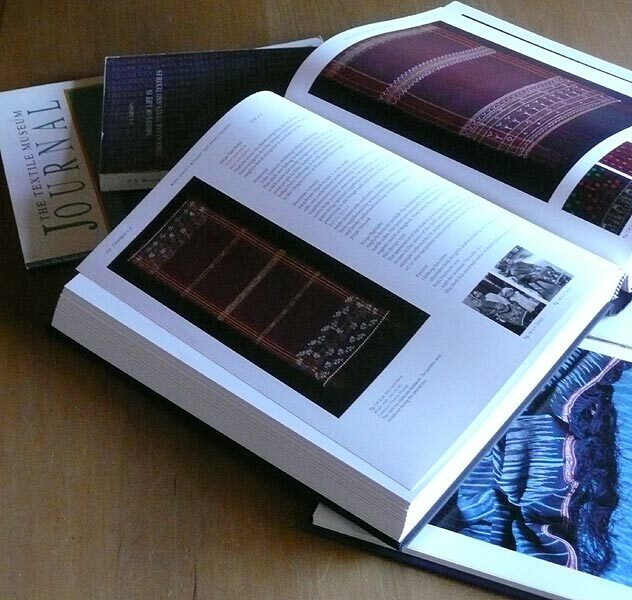 The most complete analysis of Batak textiles ever published, with book design by prize-winning art book designer, Marie-Cécile Noordzij-Pulles, it is a tour de force. This note is not a review of the book. During the last three years I have become too closely involved with it and its author to feel able to do that objectively and, although I have read sections of it in production and have been constantly dipping into it since receiving my published copy, at 568 pages it deserves a serious chunk of time to read it cover to cover which I have not yet been able to devote to it. Our joint hosts, Lejo Schenk, Director of the Tropenmuseum and Dr Harry Poeze, Head of KITLV Press, Sandra and myself were all drawn onto the stage by a group of Batak dancers and each ceremonially draped in an ulos and thereby blessed by the act. Sandra selected a beautiful Silindung valley ragidup from her collection for Harry, usually only worn by a grandparent, as he had recently become a grandfather for the first time. Appreciating its significance he had a lovely proud grin on his face for the duration and Sandra later made him a gift of the cloth. I chose a very fine 100-year old na marpisoran from my collection woven by Ernestina boru Hutagalung in the village of Huta Harean (Silindung valley) during the first decade of the 20th century. By a fortunate serendipity this turned out to be the same village from which the lead dancer, Paul Hutagalung, originated! I had the privilege of watching Leo Schenk’s awed face as he leafed through the book before the ceremonies began. 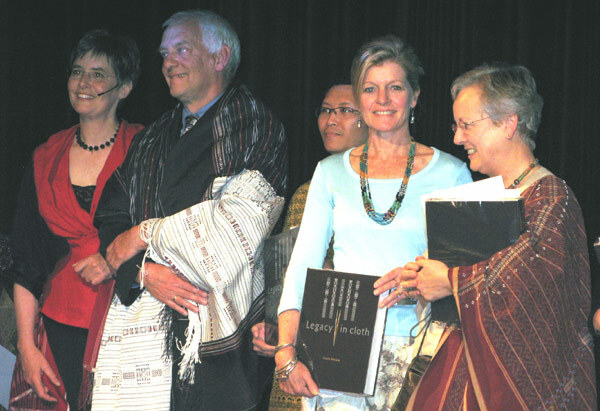 In his welcoming speech he paid tribute to the book as "a bible that everybody who does Indonesian textile studies in the future will have to refer to." It was Leo’s belief in the book that made it possible to launch it in the Tropenmuseum. Next Sandra wants to raise the funding to have the book translated into Bahasa Indonesia and to take it ‘back to the villages’. “When I return to the Batak villages in 2010, I want to be bearing armloads of this book. I want to present one to each weaver who helped me with my research. I want to show the weavers where they are depicted in the book and watch their faces light up. I want to thank them and honour them.... No doubt the book will stimulate more recognition from the village leaders and from their neighbours and families. Years later, I will want to see whether the book has inspired new textile designs, or the re-making of old ones.” We hope Sandra will come to the UK in November to tell us about her ‘back to the villages’ dream." (See Sandra's Nov 2009 schedule). 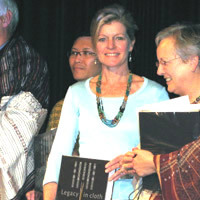 Legacy in cloth: Batak textiles of Indonesia by Sandra Niessen, published by KITLV Press, Leiden, May 2009 – Netherlands launch, 15 May 2009. See photos of the launch.